Is there any 3rd app to upload videos to YouTube? A variety of Apps supports uploading of videos to YouTube. With the advancement in technology, new Apps are being introduced every day. There are more than three Apps that can be used in uploading videos to YouTube. Read this article to know more about those Apps. 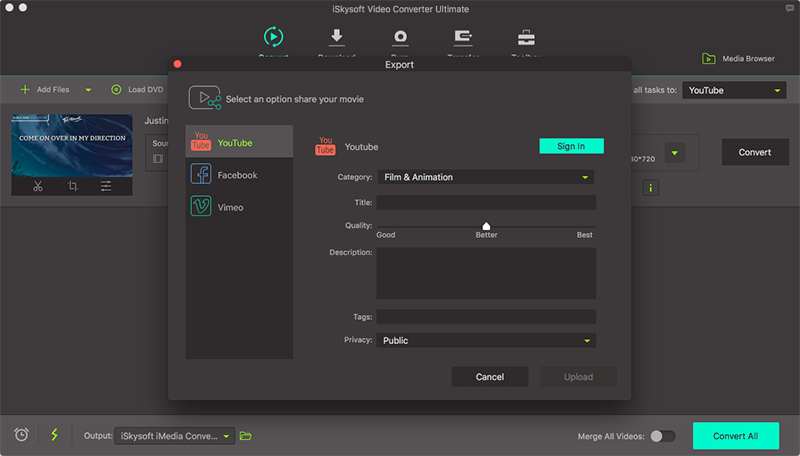 iSkysoft Video Converter Ultimate for Mac (or iSkysoft Video Converter Ultimate for Windows) is the perfect tool to convert and upload videos to YouTube. The tool converts more than 150 audio and video files in batch and with no quality loss. It also helps to upload videos directly to YouTube even for the formats that are not supported by YouTube. It is the fastest converter compared to its competitors since it converts files 90 times faster than its competitors. A variety of editing options such a trim, crop, merge rotate, volume, brightness, special effects and more. Inbuilt video downloader to download videos from online sites such as Facebook, YouTube and a video recorder to record video clips from streaming sites. An ultimate DVD toolkit to copy, edit, backup, burn and copy DVDs. Converts to almost any video and audio file formats, and it converts audios and videos to formats supported by androids, iOS and gaming services. It uploads videos to a variety of sites such as YouTube, Vimeo and other more than 1000 streaming sites. Run iSkysoft Video Converter Ultimate for Mac and import videos by going to “File” and clicking “Load Media Files” to add videos from their location. Alternatively, drag and drop the videos to the program’s window. Once you import the videos to the program, there is an “Export” menu on Mac. Click the option and then select “Uploading to YouTube”. The option lets you upload videos directly to YouTube. However the feature only exist on the Mac version and for the windows, users will have to convert the video first into supported formats and then upload the videos to YouTube. 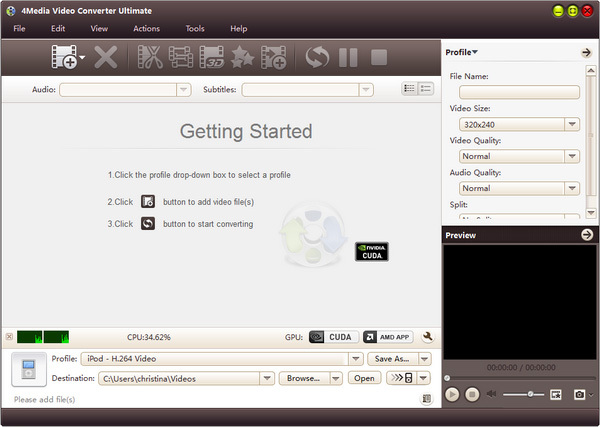 iFunia Video Converter has a video Uploader tool that helps upload and to YouTube. It allows you to create videos from your mobile device. It converts videos to files supported by YouTube upload, and it converts videos at an incredible speed. 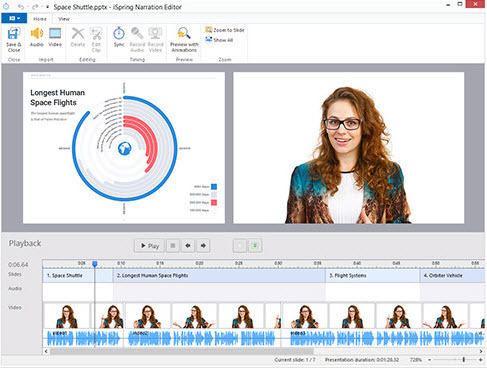 The key features of this tool include the ability to edit videos, uploading videos to YouTube and the ease of use. 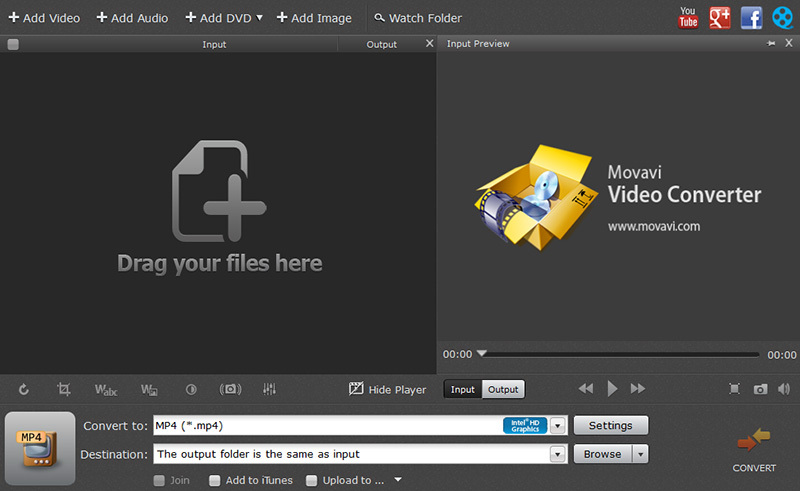 iFunia Video converter also allows you to convert files to iMovie, iDVD and iTunes. It has a lot of customization editing and export tool not found in other software. It lacks a DVD toolkit. It cannot download videos online. 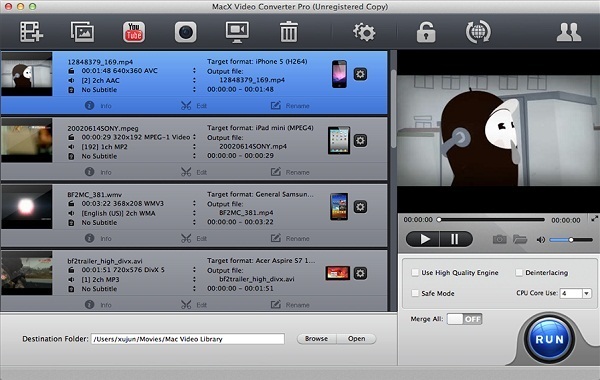 MacX Video Converter Pro helps in converting and uploading videos to YouTube for sharing with friends. It supports conversion and upload of more than 320 video files. Other features include the ability to convert audios into different audio output formats. It also converts formats supported by iPhones, iPads, Samsung Galaxy and other more than 350 devices. It has a variety of editing options, and apart from uploading videos to YouTube, it helps upload videos to other famous sites. It has other features such as screen recorder and slideshow maker. Unlike other YouTube up loaders, the tool does not support DVD ripping functions. 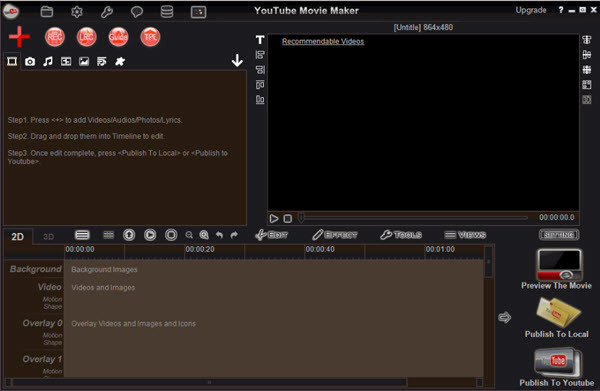 YouTube Movie Maker helps users to make and upload videos to YouTube without worrying about the file format or profile. Other features include the ability to make pro-quality 2D/3D videos from various formats of photos, videos, lyrics, music, texts, etc. it has editing features such as the capacity to add texts, titles, credits, transitions special effects, etc. it also can add motion effects to pictures and photos before sharing them to YouTube. It works on all Mac and Windows versions. The Mac version supports macOS 10.6 and above while the Windows version works with Windows 7, 8, 10, XP and Vista. You can add all mix multiple music, audios, sounds, and voices to a video before uploading it. It makes it easy to customize videos’ size, and position or to add special effects. Sometimes the speed of the upload can be very slow. DVDVideoSoft is one of the best programs to upload videos to YouTube without the using the original YouTube web interface. The features for this software include, it uploads single and batch videos at high speed. You can also upload videos while through a proxy, and you can manage videos using with a single click and apply options such as response, comments, votes, and ratings. It supports Windows 10, 8, 7, XP and Vista. The program has no spyware or adware, and it is 100% free to install and run. There is no version for Mac. Movavi Video Converter not only supports conversion of videos ton YouTube supported formats, but it also lets you upload videos to YouTube right after conversion. The key features of Movavi Video Converter include the ability to convert videos to almost any popular file format including, FLV, DVD, HD video, MP4, and much more. It also has a variety of editing features such as contrast, brightness, cropping, etc. It occurs in Mac and Windows version. The Mac version supports macOS 10.6. The windows version supports it also supports Windows XP, Vista, 7, 8 and 10. It converts videos for YouTube uploading without no quality loss. It has additional video management feature such as soundtrack, DVD ripping, batch processing and video merging. It does not support downloading of online videos. 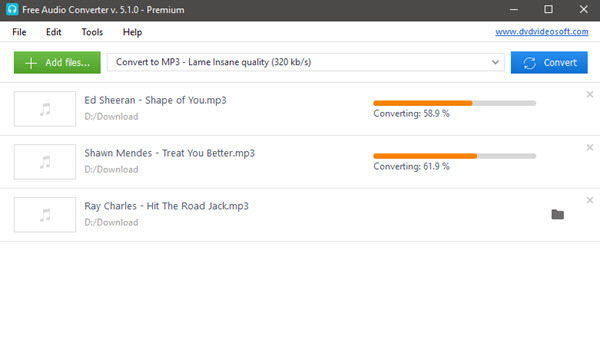 Leawo Video Converter is not only a video converter but a YouTube uploader and downloader. It converts video to files supported by YouTube and then uploads them for sharing. The key features include, it converts DVD, audio, and video files for Ios devices, Androids, and Blackberry devices. It helps in uploading and downloading videos to YouTube, Facebook, Veoh and other popular sites. It converts 2D videos to 3D files with zero quality loss. It doesn't support macOS 10.11 El Capitan or above. iSpring River is a tool that helps convert PowerPoint to videos and upload them directly to YouTube without saving them on your computer. The main feature of iSpring River is the ability to create videos with adjustable quality and size. It supports macOS 10.9, 10.6, 10.7 and 10.8. You can upload videos to YouTube instantly without having to save the video on your computer. It works as a PowerPoint plug-in. Aimersoft Video Converter creates the best video formats for Playback on other devices and YouTube upload. It converts videos into a variety of formats such that you do not have to worry whether YouTube or other devices such as Androids and iOS devices will support your video file. More features include the ability to convert videos to watch on gaming systems, ability to download videos from websites and the ability to edit videos before uploading. The tool has dozens of presets to help convert videos to a variety of YouTube supported formats. No technical support is offered via a telephone. 4Media Converter provides the ability to convert videos and upload them to YouTube and for playback on phones and tablets as well as gaming systems. The greatest feature is the capacity to share videos on online sites such as YouTube and Vimeo. It works with Windows XP, Vista, 7, 8, and 10 as well as macOS 10.7 and above. It is easy to use and is accessible for new users. The tool does not offer any unique feature to stand out from its competitors.